Whenever I travel to the US, breakfast is a daily highlight of my trip. From eggs and bacon, to waffles to pancakes. Egg Benedict or Florentine if you are at somewhere a bit more atas. But my favourite is Steak And Eggs which I first tried at a local diner off the strip at Las Vegas for a awesome price of USD 5.99 (about SGD 7.50). First of all, this is quite a substantial breakfast and not widely available. Hence, it's a real treat every time I have that. This one above was taken in the Capital. Who would have thought that I'd find it here? I found this restaurant in Sanlitun Village in the Capital. There were two American Bar and Grill restaurants side-by-side. This was found at the Blue Frog Bar & Grill on the third floor of S4 Tower. 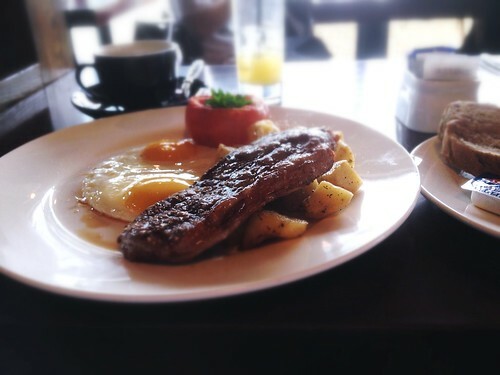 My bill for a coffee, OJ and the Steak & Eggs was RMB 110.00 (about SGD 22.00). Not the cheapest breakfast around but I supposed once in a while is ok lah! Their neighbour is the Union Bar & Grill which is a subsidiary (or sister) restaurant of Dan Ryan's of Chicago. I had the chicken quesadillas there a few days before that and it was pretty good although I still think fondly of the crabmeat quesadillas I had at LAX back in 2006. Next stop. Babyback Ribs. I think Union Bar & Grill will be the better place to check out. Lunch is cold food bought in the morning.. -_-"
Ash: Have a good dinner then?